Philip Lowry believes Crusaders have found the habit of winning football games again after a slow start to the season. Remarkably the reigning champions have lost four games in the Danske Bank Premiership so far this season. But with three league wins on the bounce Lowry feels the Seaview side are getting back to their best again. “This league is all about momentum,” he said. “We got a good result against Institute and winning the north Belfast derby and the manner of it by scoring in the last minute gives a lot of confidence. “The games are coming think and fast. We will be aiming to pick up another three points on Saturday, but it’s never easy at Coleraine. It will be a sibling showdown at The Showgrounds on Saturday as Philip goes toe-to-toe with brother Stephen. The Crues man though admitted he doesn’t really enjoy games against his brother. “It is difficult and I don’t really enjoy it as your family is all there watching, and it’s usually in the big games as we play for title rivals,” he said. Lowry picked up his fourth Irish League winners medal last season after slugging it out with the Bannsiders in an epic battle. “It was a crazy year with Coleraine pushing us to the very end,” he said. “That six month period from before Christmas to finally getting over the line is as sweet as it gets really. “At Ballymena on the final day it looked like we had thrown it away again. “At the final whistle it wasn’t even a sense of happiness, it was just pure relief. “I don’t think I had slept in the week leading up to that game, I was a nervous wreck and I had already won the title on three other occasions! 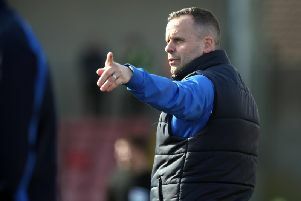 “If Coleraine had nicked a goal that day I honestly don’t know if we would have had it in us to come back because we were struggling that day - we weren’t playing well. Coleraine have also suffered a hangover from last season, but Lowry believes they will find their groove again soon. “It’s a funny one for Coleraine this season as the highs of last year were always going to be difficult to maintain,” he said. “I think their problem at the minute is squad size. The injuries and suspensions is hurting them at the minute. “When they have their first eleven fit though they are as good as anyone in the league. “They have suffered a bit of turmoil losing Brad Lyons and Oran Kearney. “Rodney is a top manager and has done brilliantly at Dungannon, but he would be first to admit it’s a work in progress there at the minute. “It will take a bit of time for him to get his stamp on things. “I think playing twice in Europe didn’t helped us at the start of this season. We were on the end of a couple of bad results and that led into an early season hangover. Bannsiders boss Rodney McAree will be hoping to pick up his first win sooner rather than later, but he’s expecting a tough game on Saturday. “It will be another tough one as Crusaders have seemed to have picked up a bit of form,” he said. “They’ve scored six goals in their last two games against Cliftonville and Glentoran. “Crusaders have the capabilities of doing that, they are the league champions and that’s the challenge ahead of us.